Well, turns out I have something to say after all! In fact I have so much that I am breaking it in two posts. Remember this a beta. Things will change before release. In fact there has been a few between the last beta weekend and this one. More about it below. I am purposely not getting too deep into the game now as I don't want to spoil things for me after release or planning too much since, like I said above, things will change. Alright. Now that we took that out of the way, here are the things I noticed during the first day of the Second Beta Weekend! P.S. : I will try to add some screenshots later to spruce up both posts. Right now I have some more Guild Wars 2 to play while I can! The most obvious change has been of course to the UI. They moved the dodge energy bar to be on top of the health circle, changed the mini-map from a circle to a square and added chat bubbles. The dodge bar change is something I am still unsure about my feelings on it. It isn't a bad change I guess, it is more a question of habit. In the beginning I kept looking to the right trying to find it. Took me a while to get used to it being on top of the health circle. On the other hand I kept dodging more this time around and once I got used to its new position I would check to see how low it was so I could try dodging again. So I guess it worked. The mini-map change is another I am not sure about. Though in this case it is purely due to an aesthetic taste. It is nice to be able to re-size the mini-map though! As for the chat bubbles it was a nice addition. It makes it much easier to figure out who is talking and what the conversation is. Specially if you are not a native english speaker (which is my case) or play with the sounds off (which is not my case). They also added a map channel now. The map channel is pretty much like ye olde local channel. And as the name implies, you can talk to anyone else in the same map through it. This may be a curse or a blessing depending on what kind of player community forms after the game is released. Last night I didn't really pay attention at it to see what kind of conversations were going on, all I know is there was a lot. In any case, there is always the option to turn it off for those who prefer some quiet moments. 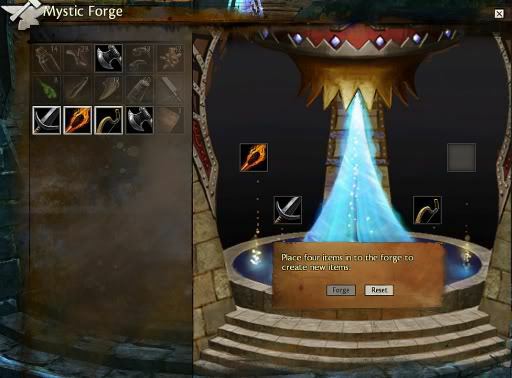 The Mystic Forge in Lion's Arch was another touted addition in the recent announcements of the beta weekend. I only used it once but it was something interesting. You need four items to throw at it. Depending on the first item you select, it will fade out any other in your inventory that wouldn't work, leaving only the ones that could make something with your selection. You can choose any item combination, even those it will say it won't work, but then the create button keeps greyed out and unclickable. Once you select four valid items that work together it will give you something in return. My choice of sacrifice was a two handed sword, a longbow, a torch and an axe if I recall correctly. I got back a blue axe of level 11 (my level at the time) with +9 healing, I think. It wasn't something uber powerful but still better than my expectations. I was expecting the RNG gods to mock me for my folly and give me some literal junk to sell to the NPC. In a related note, the server was brought down for a little (with a formal announcement and all that!) for a new build of the game. 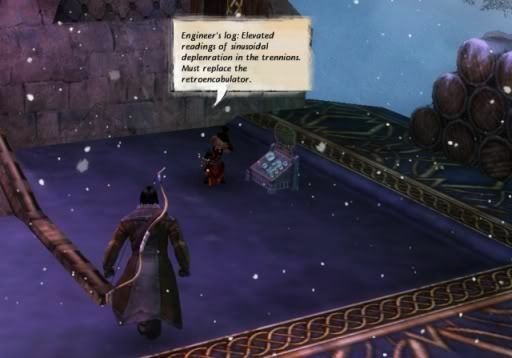 It is nice to see the team at ArenaNet working to fix issues so fast. Usually during betas I expect these kind of things to happen only between the different beta tests. A cool thing I discovered during this beta weekend, and this may be old news to some people, is that you can dye your gear at any time, without any costs. All you need to do is open the hero window and toggle the dye mode. 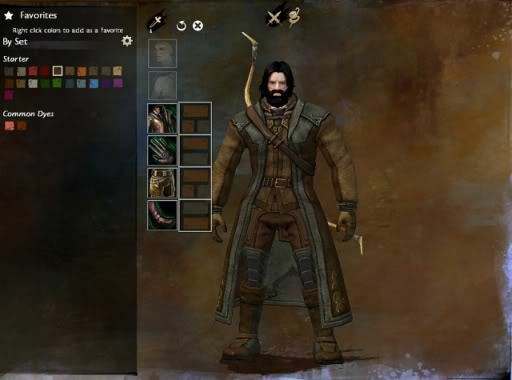 All the dyes from the character creation are already there with other dyes being acquired either as drops, in the in-game market or in the cash shop. Also I don't know if they upped the loot chance on the dyes but I got two last night. It was nice to see that they get unlocked for the whole account, not just the character you used it with. EDIT: Actually it is just for the character you use it with. I should have double-checked before writing that. /sighEDIT 2: Apparently what made me do the first edit might have been a bug. I will try to verify this next time and post the results if I don't forget it. /le sigh 2EDIT #3: ArcherAvatar copied some information from the official beta forums that the dyes are actually character bound. Oh, almost forgot! They also added rewards for achievements. From the daily achievements I got just some XP and a few coins. From completing the newbie area map (filling all the renown hearts, discovering all the points of interest, skill challenges, etc.) I got something more substantial. A sword, some crafting materials, a pair of gloves that I couldn't use due to my class and 3 transmuting stones (allow you to copy the stats of one item to another). Plus some XP and a few coins. Previous article:[GW2] My second beta weekend to do list! I suppose we can all hope they come to their senses on this issue and at least return it to an account-wide system. As it currently exists I believe this system will consistently erode the goodwill of the player community, but I have already been quite vocal in my opposition to "pixel gambling" for real money... this is simply a worst case example of that. Thanks ArcherAvatar! I guess that clears that bit up then. And yes, I don't like the "pixel gambling" either. Even more so now that the dyes are character bound now, instead of account wide.